Check the latest modification to the Peta-pico-Voltron project! The Single Channel High Voltage Power Supply (SHVPS) consists of a programmable voltage source capable of producing a user-controllable HV DC voltage. A fast switch allows to quickly turn the voltage on and off to create a square voltage of a frequency up to 1 kHz. The HVPS has been developed primarily to drive and control Dielectric Elastomer Actuators (DEAs), which are electrostatic soft transducers that require a high driving voltage (up to 5 kV depending on thickness) at low current (typically <100 uA). Most commercial high voltage power supplies are ill-suited for DEAs: they are bulky, heavy, not to mention utterly expensive. With Peta-pico-Voltron, we wanted to develop a do-it-yourself HVPS packing a lot of functionalities into a small footprint. We have dedicated a lot of effort to design an elegant hardware solution in conjunction with a firmware that contains a lot of functionalities. In addition, a comprehensive graphic user interface, and library of function make Peta-pico-Voltron very easy to use and to integrate with other instruments. The SHVPS consists of a programmable high voltage source coupled to a fast switch. 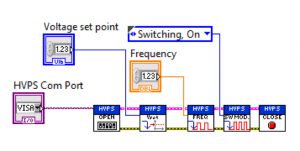 The programmable source generates a precise voltage, and the fast switch allows to connect ground or the source voltage to the output connection, thus making it possible to generate either continuous or square waveforms. Voltage rating: HVPS can be manufactured with different maximal voltages. We have built and tested units with the following ratings: 5kV, 3kV, 2kV, 1.2kV and 500V. The SHVPS uses an EMCO A-Series DC/DC converter, and any model can be used to build a HVPS. Voltage set point resolution: 0.1% of full scale. Voltage control modes: Internal (open loop or regulated), or external analog voltage. Frequency range: 0.001 Hz to >1kHz. Source of switching signal: Internal timer, manual push-button, or external 5V TTL signal. Ability to control several SHVPS in parallel. Safety feature to limit the output voltage below a user-defined level. Memory function to store parameters in the unit. 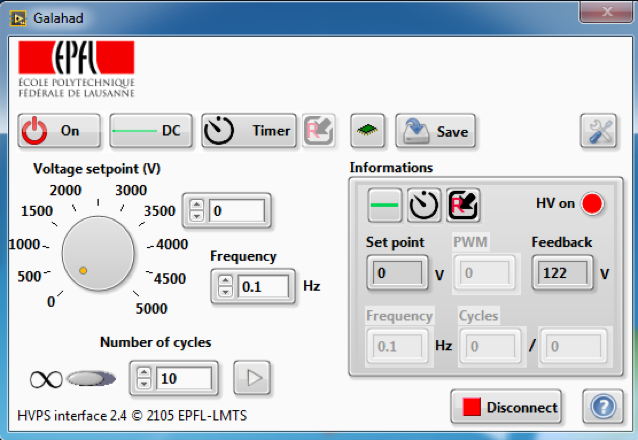 LabVIEW library with all the necessary functions required to program the SHVPS and to synchronize it with other instruments. Project Peta-pico-Voltron is an open-source High Voltage Power Supply (HVPS) for low-current application. And why this name? Well Peta*pico: 1E15*1E-12… Look it’s a kilo Volt! This HVPS was developed at the Microsystems for Space Technologies Laboratory (LMTS) from the Ecole polytechnique fédérale de Lausanne by Samuel Schlatter and Samuel Rosset, under the direction of Prof. Herbert Shea. The HVPS has been developed primarily to drive and control Dielectric Elastomer Actuators, which are electrostatic soft transducers that require a high driving voltage at low current. Our aim was to develop a cheap and compact power supply packing a lot of functionalities on a small footprint. We have received inquiries from several research groups to sell them HVPS. However, we don’t have the manpower or infrastructure to assemble and sell devices. Therefore we have decided to release all of the necessary information (PCB layout, software, assembly instructions and user manuals) in the form of an open project in the hope it will be useful to the community. Share and enjoy! 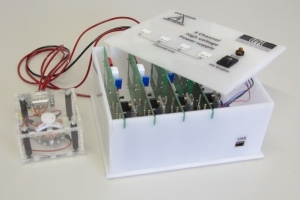 Project Peta-pico-Voltron started in June 2015, with a release to the public as an open-source project in March 2017 during the EAP in-action live demo session at the Electroactive Polymers Actuators and Devices (EAPAD) conference in Portland, Oregon. Samuel Rosset (ABI/EPFL): Samuel is leading and coordinating the project. He is working on the software side, namely on the firmware for the microcontroller, as well as the graphic user interface. He has developed and programmed the calibreation routines, and taken care of documenting the project on this website. He has recently moved to the Auckland Bioengineering Institute, but is still working on the Peta-pico-voltron project. Samuel Schlatter (EPFL): Sam is working on the hardware side of the project and has designed the HVPS circuit and PCB. He has established and documented the assembly and testing procedures of the board and has been supervising the engineers who have assembled and tested the first units. Herbert Shea (EPFL): As head of the LMTS at EPFL, Herbert has been a key support for this project. First by recognising the need to develop such a power supply, due to the lack of commercial products meeting our requirements. But most importantly by allocating financial resources and manpower to turn this idea into a functional product. Patrin Illenberger (ABI): Patrin has developed the battery charging circuit used for the standalone configuration which comnines the HVPS, a Raspberry Pi, a touch screen and a battery into a single independent package. Additional help: We wish to thank Mr. Pierre Zenklusen, for his precious help with the assembly and testing of the first generation of HVPS, as well as Mr. Aymeric Schafflützel for the design and assembly of the enclosures. The project peta-pico-voltron and the hosting of this website have been supported by Prof. Herbert Shea’s Soft Transducers Laboratory at EPFL, Switzerland. The development of the battery management PCB has been supported by Prof. Iain Anderson, the Biomimetics Lab, and the Auckland Bioengineering Institute. The text and images on this website are published under a Creative Common Attribution Share-alike (CC-BY-SA) license. You are free to copy, share and adapt the contents. You must give appropriate credit to project Peta-pico-Voltron, provide a link to the license, and indicate if changes were made. If you remix, transform, or build upon the material, you must distribute your contributions under the CC-BY-SA license. The codes and programs are distributed under a GNU General Public License (GNU GPL v3). The information on this website, the codes, and software are distributed in the hope that they will be useful, but without any waranty; without even the implied warranty of merchantability or fitness for a particular purpose. The High Voltage Power Supply (HVPS) is capable of producing high voltages. Although the current is limited to a safe value, touching the output can lead to shocks and/or damage to sensitive equipment. The authors decline all liability in the event of improper use, incident linked to the use of the HVPS or damage to equipment.